Amy Lutz is an author and mother of a severely impaired autistic son who has had serious aggressive and self injurious problems. She will give a presentation regarding her own journey with her son, and the successful treatment she has encountered. After her presentation there will be open Q and A regarding various treatments and interventions. Those attending will be encouraged to share their sons and daughters particular aggressive/self-injurious challenges, along with an open dialogue on ways to intervene. ​This event will be LIVE STREAMED if you cannot attend! Participants will become familiar with fair housing laws as they apply to people with psychiatric and/or developmental disabilities, reasonable accommodations for impairments that may enable tenants with these disabilities to remain living in their homes, the process to request a reasonable accommodation, and housing issues and challenges that people with psychiatric disorders and/or developmental disabilities face that are a result of or that exacerbate their disorders. 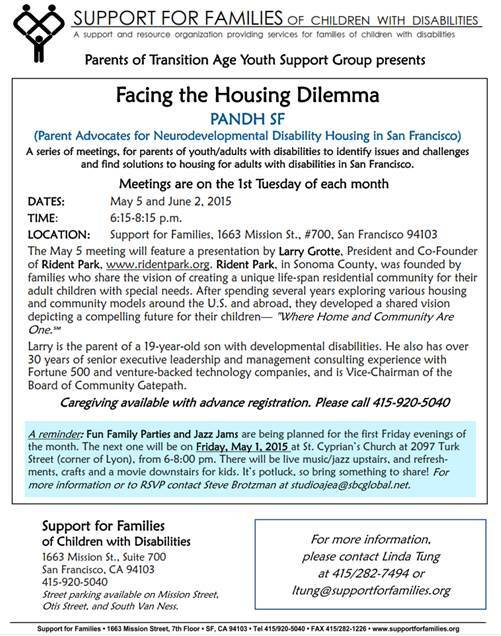 Please join us for our monthly PANDH SF meeting at Support for Families. Jan Stokley, the Executive Director of Housing Choices Coalition, will be discussing the living opportunities she's worked to create for individuals with Developmental Disabilities in the Bay Area. 4th of July Party for AzureFamilies! Fourth of July extravaganza complete with videos of fireworks, live jazz upstairs featuring some of the greatest bay area musicians around, food potluck, soft drinks, beer and wine. Just for our families with developmentally disabled / autistic kids and young adults - all behaviors welcome. Monday May 18, Tuesday, May 19th, and Thursday, May 21st! As many of you know, last Friday Gov. Brown decided to NOT allocate the funding desperately needed to sustain our regional centers and service providers. On Monday and Tuesday there will be meetings and demonstrations in Sacramento. PANDH-SF will have a group go this Tuesday from the bay area to Sacramento with arrival planned for 9 AM. There will be a walking rally at 9 AM, and public hearings beginning at 10:30. We will have the opportunity to give input. Although it may seem hopeless to many of you, the legislature can still negotiate with the governor. A show of numbers at this point can truly make a difference. If you can possibly join this group, email Audrey deChadenedes immediately at audreydec@gmail.com. You can also call or text her at (415) 867-3245. She will coordinate. This is a last ditch effort to let Gov. Brown know that there is a sizable population in this state of families of the developmentally disabled who demand to be heard and not ignored. 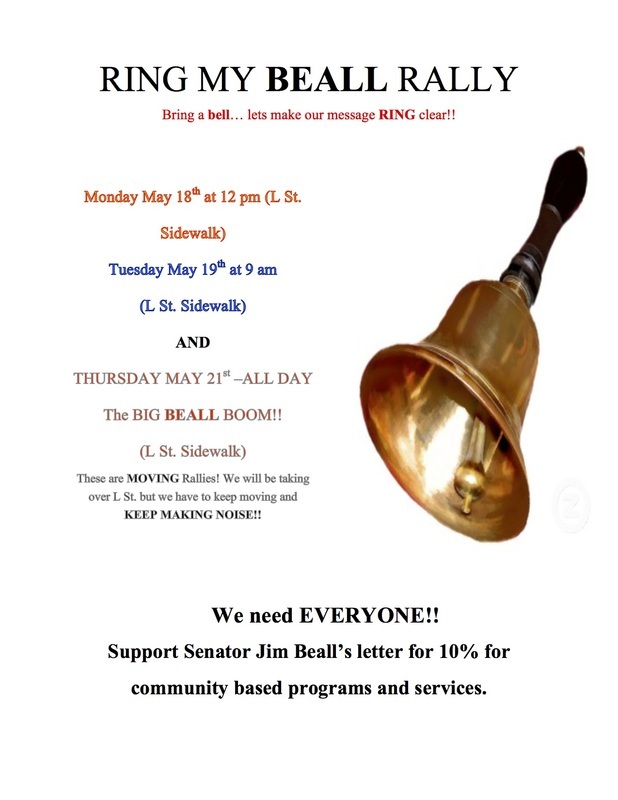 Please join us Friday, May 8, 2015 at the Civic Center Plaza from 1:00-2:30 PM to voice our concerns about the dire need for sustainable Regional Center support! San Francisco Community Land Trust is holding a free Workshop! Sunday, April 12 at 7pm/6c Dateline NBC Investigates 'Aging Out' with Autism in "On the Brink" On Sunday, April 12 at 7pm/6c, Dateline will feature a piece produced by Marjorie McAffee that investigates the process of "aging out" with autism. Madison House Autism Foundation has been pleased to be involved in the discussions on this project. 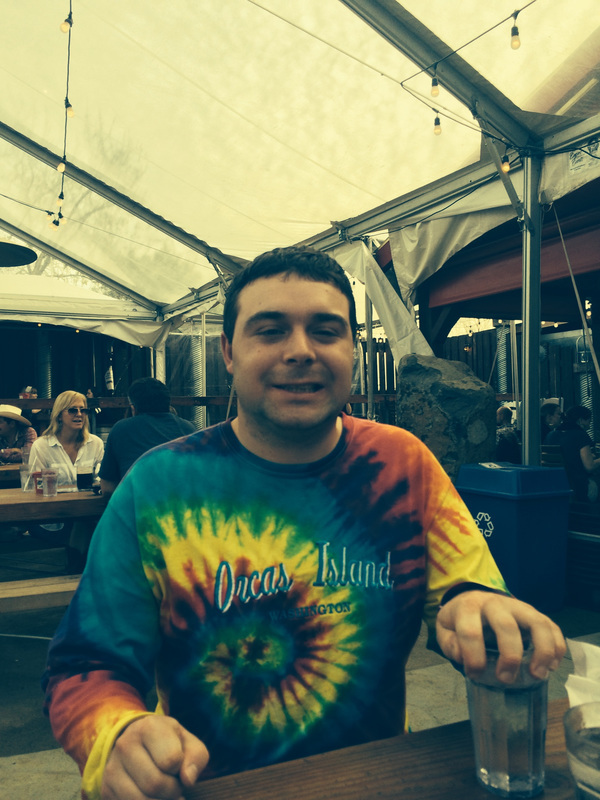 Adults with autism have been an almost invisible population. Recently, a national conversation has been developing on the issues individuals and families face. Thank you to NBC and Marjorie for shining more light on this subject. We challenge others to address ways of formulating a positive future for adults on the autism spectrum. Please view the preview below, and click here for the press release. PANDH SF Community: This looks like a great insight into the difficulties of what we are and will be facing as our loved ones age. While not specific to San Francisco, it is addressing the same major concerns that we're having with a lack of appropriate resources for individuals with neurodevelopmental disorders to not only live, but also thrive through adulthood in their communities. Please feel free to forward onto friends, families, community members, and more to help them understand the problems we are facing. Update: if you missed this showing, you can find the documentary on Netflix. 9th annual Tools for Transformation Conference presented by the Special Needs Network. Tell State Assemblymember Phil Ting Your State Budget Priorities! Participants will complete an interactive exercise created by Next 10, a local non-profit organization, to decide spending on schools, transportation, the environment and other services as well as revenue options to fund their priorities. This will show the challenges faced in Sacramento about spending the funds available. For more information and to RSVP, please click here. Hope to see you there! Please join us for a Rally at the Capitol. Contact PANDSF@gmail.com for more information. Barry Benda of Brilliant Corners will be joining us at our monthly meeting to discuss "Legacy Homes: A possible housing solution for your developmentally disabled adult child". Please join us at Support for Families. Pat Napoliello of the ARC of San Francisco gave an excellent overview of the Lanterman Act and provided valuable information to advocate for our child's rights and entitlements at your next IPP at the February PANDH SF monthly meeting. On March 2nd the San Mateo Board of Supervisor's held a ½ day public hearing on the crisis in affordable housing. Here's the full White Paper and Press Release. Here's the link introducing the Executive Summary of the staff's White Paper and you can watch a video of the Affordable Housing Study Session here (it begins at 2:03:30 on the play-progress line at the bottom of the video window). 12/19/2014 - The Coalition for Community Choices recently sent a letter to the Centers for Medicare and Medicaid Services expressing concerns and requesting changes in response to the Statewide Transition Plans.